Juicy, sweet, mild-flavored fruit is crisp like apple. Early to mid-August in Central Calif. Keeps well. Easy to grow, heavy bearing small tree. Estimated chill requirement: 300 to 400 hrs. 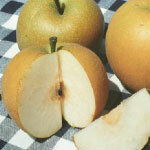 Self-fruitful or pollenized by Shinseiki, Bartlett, or other pear or Asian pear. High-scoring in taste tests: perhaps the tastiest Asian pear. Large, juicy, sweet, flavorful, refreshing, crisp like an apple. Brownish-orange russeted skin. Harvest early to mid-August in Central CA. Estimated chill requirement: 300 to 400 hours. Pollenized by Shinko, Chojuro, Bartlett, or 20th Century. Late ripening-September in Central Calif. - and excellent quality. Juicy, sweet, flavorful, refreshing, crisp like an apple. Golden brown russeted skin. 450 hours. Pollenized by Hosui, Chojuro, Kikusui, Bartlett. Juicy, sweet, refreshing, crisp like an apple. Easy to grow. Keeps well. Harvest late July/early August in Central Calif. Bright yellow skin. Vigorous, heavy bearing (usually by 2nd year). Estimated chill requirement: 250 to 300 hours. Self-fruitful.